Take pride in riding Metro! We have a new design for 2018! 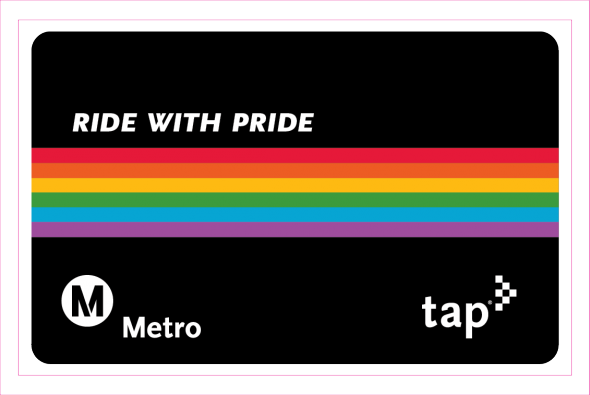 Metro will be stocking limited edition Pride TAP cards at select TAP Vending Machines starting May 16, just in time for Long Beach Pride (which you can get to via Metro). There will be a second drop of cards during LA Pride Week, and a final drop in August before DTLA Proud Festival. See the schedule and locations below. …and at Metro Customer Centers. Stickers will be located above the TVM screen to show which machines are stocked with the limited edition cards. TAP cards cost $1 at TVMs (plus minimum of $1.75 stored value loaded on card), or $2 at the customer centers (plus minimum of $1 loaded on card). The customer service center at Union Station would allow me to add $1 to my TAP card!! I had 75 cents left and figured I would be able to add $1 to pay for a one way fare. So, how can people who are buying a TAP card add only $1? If you intend to actually use the TAP card and are willing to register it online, you can add $5.05, $7.99, $22.56, etc. to your TAP card’s stored value. You can easily restore the balance to your desired ending number, or to multiples of $1.75 if that is what you need. How long will these be available for? Like if I’m at Union Station on May 17th, will I be able to find a ticket booth that is selling the Ride With Pride TAP cards? There are a few thousand cards for this first drop, so you should be able to get one. And the second drop in June has even more cards! WOW!! That was fast! These TAP cards are sold out at Willow Station!! All three machines! Wish I could find LAST years card with the larger rainbow pattern. Way cooler. Sorry to hear this! We were told each customer center is supposed to have received approximately 400 cards. I recommend contacting CustomerService@taptogo.net if there are any issues with distribution. P.S. if it helps, the June 2 drop includes TVMs at Union Station and there will be about 8k cards loaded, so you shouldn’t have any trouble getting them.